Low-income tenants say city landlords are letting them be overrun by bedbugs and cockroaches. When the Salt Lake City Redevelopment Agency relocated 60 residents in June from the pay-by-the-week, single room occupany (SRO) Regis Hotel, the city ordered that no new rooms should be rented out because of their preparations for selling the low-income property to private developers at the end of the year. Nevertheless, the 34 remaining residents of the Regis soon found themselves welcoming plenty of new guests—swarms of cockroaches and blood-sucking bedbugs. A building more than 100 years old, the Regis has been no stranger to intermittent pest problems, but things got bad when the relocated tenants were encouraged by city officials to leave behind all their possessions to expedite the move to a new housing facility called Palmer Court on 999 S. Main. With more than 30 abandoned rooms, many allegedly containing garbage, tenants who remain say the once occasional pest problem has become a major infestation. “There aren’t enough adjectives to describe the filth and garbage the rest of us are forced to live in,” writes David Hartley, a tenant of the Regis who is also employed by the hotel for security work. While several tenants expressed concerns over their recent treatment by their city landlords, only Hartley would express his concerns on the record in a written statement. “This is nothing more than the negligence of the RDA, a government entity, to completely ensure that the Regis Hotel is doomed for demolition,” Hartley writes. Since 2002, when the city purchased the State Street SROs, the RDA has sought developers to purchase and renovate the historic hotels between 200 and 300 South. In August, RDA executive director D.J. Baxter indicated that three potential developers were vying for the properties, and, as a result, the remaining Regis tenants would likely relocate before year’s end to new facilities being prepared at the old Rio Grande Hotel building on 300 south. In the interim, Baxter disagrees with the charge that the city is neglecting the Regis or is exacerbating the pest problem. “There’s not garbage or food left behind,” Baxter says. “[The rooms] usually contain just a desk, a bed and a mattress.” Baxter says the rooms were checked by his staff as well as by hotel staff for cleanliness. Both confirmed that there was no leftover food that might attract pests. Photos of the abandoned rooms dated the end of August tell another story. Of the 34 rooms vacated by the tenants who moved to Palmer Court, photos of 19 of the rooms show leftover food. 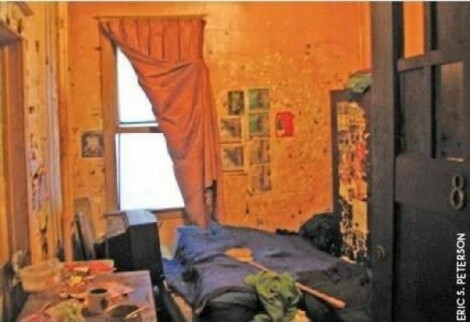 The amateur photographs detail significant squalor: jars of condiments scattered on floors, an open mini-fridge stained with mold, a metal pot in one room half-full of crusty beans, bare mattresses marked by dozens of tiny bed bug holes and one corner swarming with cockroaches. Tim Funk, a low-income housing advocate with the Urban Crossroads nonprofit, has been following the saga of the State Street SROs and feels there’s a pattern of neglect on RDA’s part in maintaining buildings they expect will be demolished. Baxter disagrees and says it’s just that comprehensive renovations may only be possible when residents are no longer there. In the meantime, measures are being taken to support the upkeep. On the recommendation of contracted pest control operators, Baxter says the leftover mattresses will be destroyed immediately. Baxter also says that the pest-control technicians are ready to assist tenants whenever necessary. Employee Hartley, however, noted in his statement that tenants told the sprayers that at least nine rooms had bed-bug infestations, yet only five rooms were sprayed. Still, it’s the messes left by the former Regis residents that make employees like Hartley question the motivations of city employees, who say they’re serving the “best interests” of the residents. “The pictures alone suggest [the RDA] may have a different definition of ‘best interests’ than the more-accepted Webster’s definition,” Hartler says.